Today I asked the Kindergarten classes this same question … and the answer came back a huge “YES!” Their art work today was beyond even my optimistic dreams! It was a perfect project for a warm Spring day … full of bright glorious color! Before exploring our Kandinsky Style, we talked about shapes and how everything you draw is made up of different shapes just modified in your mind to tweak a little and make up the whole. A simple example is a house … what shapes do you use to draw that house? Rectangles for the structure, triangles for the roof, square for the windows, and so on. We then moved on to something a little more complicated. If you want to draw an elephant, you would start with an oval for the body adding some wrinkles and details, a tube for the nose, ovals for the ears adding wavy lines around the outside to make it look more realistic, etc. 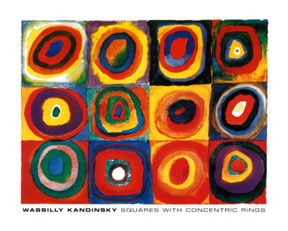 We then talked about Wassily Kandinsky, the russian artist credited with painting the first piece of abstract art that was made up wholly of shapes. 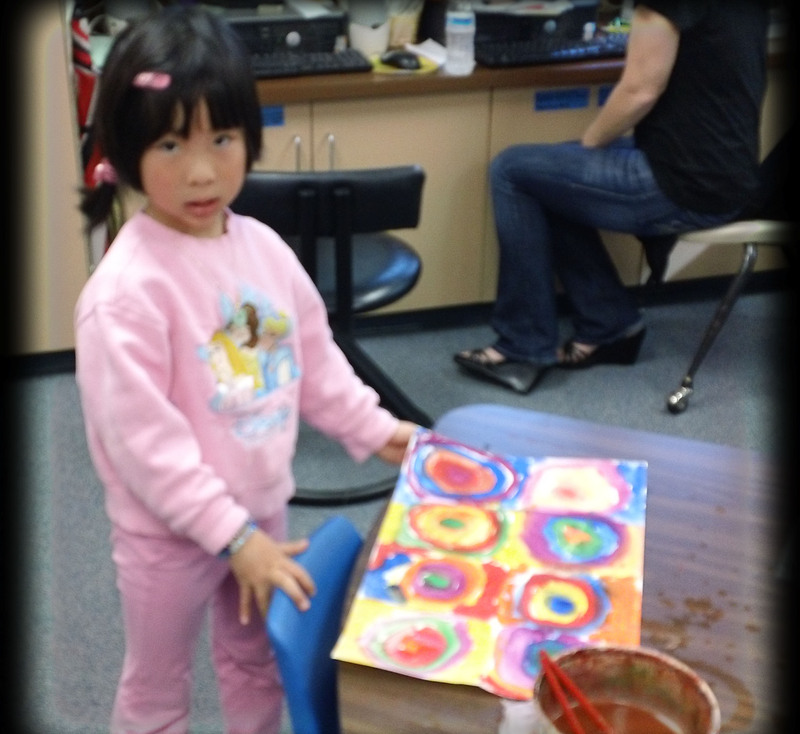 Showing them his famous painting, Concentric Circles … we now had our theme. I reminded them to look closely at his painting. Did he worry about the colors mixing? NO … it only added interest to his painting so, don’t worry about it! I think that was very freeing for many of my art shy kinders! Using 12×18 heavyweight paper, we folded our paper together in half 3x to make 8 rectangular sections to begin our shapes and concentric rings. 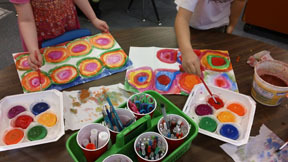 They then chose what shape to put in the centers of their paintings. I encouraged alternating colors for the rings, but some had their own idea about what they wanted to do, which is great … that is what individual creativity is all about. A little note … I also did this project in our younger special needs group and while I didn’t take pictures )-: they were also very successful. We scaled back the project to only 4 very large sections and a limited amount of paint. We had lots of smiles! 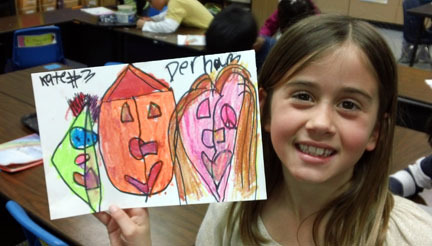 Picasso Heads in Second Grade?! Second Graders (!) did these fabulous Picasso Heads! They really got into the spirit of Picasso when they drew and “painted” them with oil pastels. It was very exciting to see how they embraced the fact that not everything needs to look exactly like the real thing … even my very linear thinkers stepped out of their comfort zone for this one! 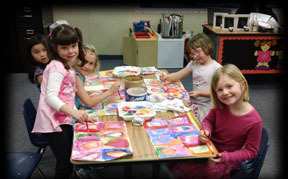 We first talked about the use of color and shapes in art to communicate feelings and meaning in a painting. Using Picasso’s Portrait of a Woman … the use of blue and cool colors, triangle for a tear, a white/open circle where her heart is, shows us she is very sad. We then moved on to the painting, Girl Before a Mirror. 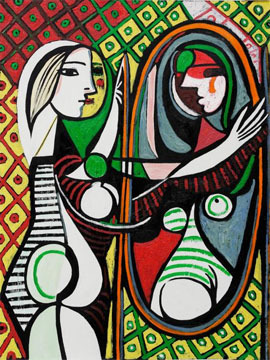 This is an excellent example of Picasso’s use of shape and color. Also, Picasso many times would put a line through the face to show that the subject has more than one personality or many sides. He also outlined everything in black to accentuate his color. 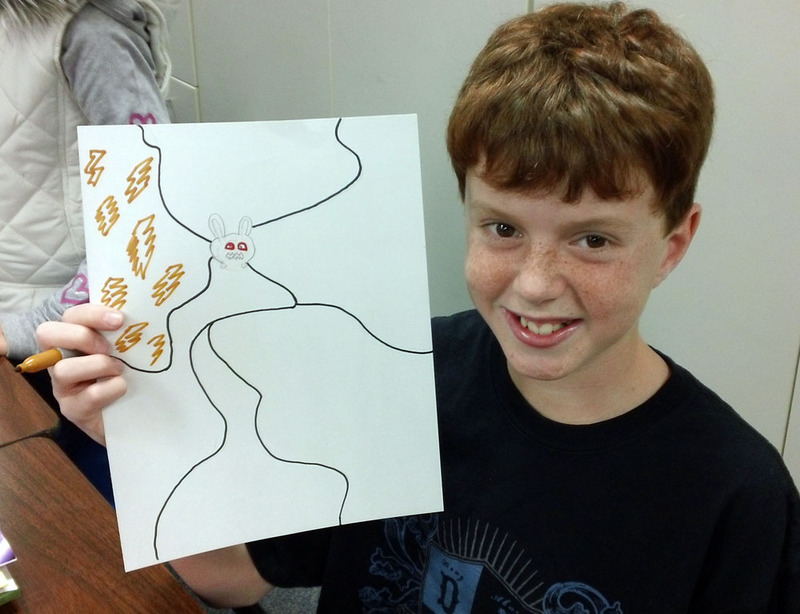 Students drew 3 heads that touched … representing a relationship between their characters. They then had to draw a line top to bottom on each head showing the 2 sides of each “person”. 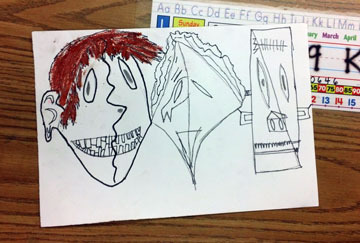 Using shapes for features, students began building the personality of their Picasso heads. We talked in simple terms about what shapes might represent. A heart for a mouth, corkscrew for eyes, etc. Of course, crazy shapes for hair is a given!!! 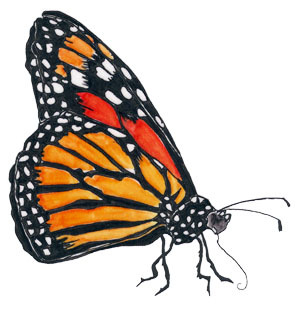 After pencil, everyone outlined in Sharpie – their choice of thick or thin lines. 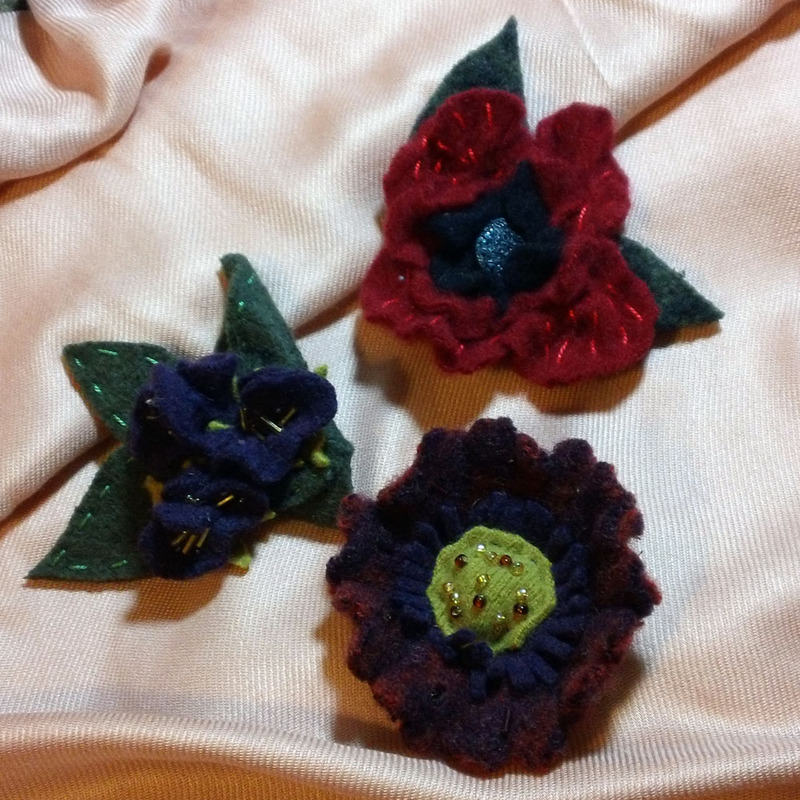 I began my creative exploration as a child by learning to sew with my Grandmother. I have always been very inspired not only by the texture of fabrics, but the unique personality given to the fabrics with dye and the printing. My personal stash of fabrics can rival anyone (just ask my husband!) and I find it hard to walk out of a fabric store without adding just a little something more … in case that perfect project comes up where I might need it desperately. LOL I save every little scrap of things I love, cut buttons off old clothes for the next project, and buy at thrift stores, flea markets, and antique sales. It is amazing what can be created from an old tablecloth or a well-loved pair of jeans! 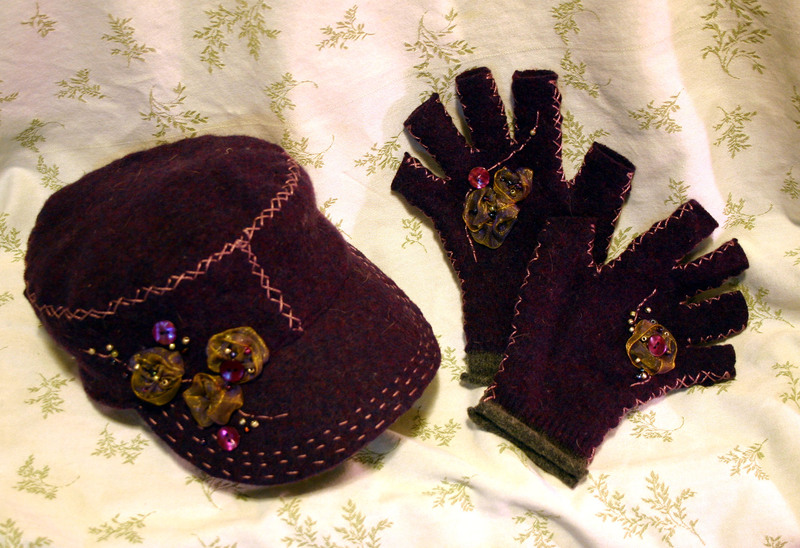 My newest creative urge has been to “felt” wool sweaters and make fingerless gloves, mittons and accessories from the wool. I have scoured thrift shops for inexpensive, nearly wool sweaters made from animal fur. I have found cashmere sweaters with a couple of holes for 5$! 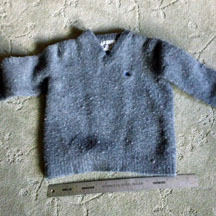 The sweaters made from about 80% or higher in wool that contains animal fur works best. Blankets, suit coats etc. work well too and you get even more “felt”! Have you ever accidentally put a sweater in the wash only to have it come out looking like a children’s sweater and have it be incredibly dense? This is exactly what you are shooting for with felting because when the wool is c ut it won’t ravel and you can make pretty much anything from it! The felting process is simply to wash the wool item in hot water, rinse in cool and then dry it in a hot dryer. Some sweaters need a little encouragement and might need to go through the process 2-3 times. If you are doing a lot of sweaters, it is recommended to put your items in a mesh bag so all the fibers don’t muck up your machines … In the “olden days” they would call this boiling wool, only they actually DID boil it in a pot of water over a hot fire! They used the “boiled” remnants for extra warm blankets and coats. Now that your wool is ready … the game begins! How do you want to cut your items out? I like to cut at the seams and spread out my sweater so I can see just how much wool I have, look and mark any holes I need to work around, and get a good picture of the design I might be incorporating into my hand-made, one-of-a-kind product. 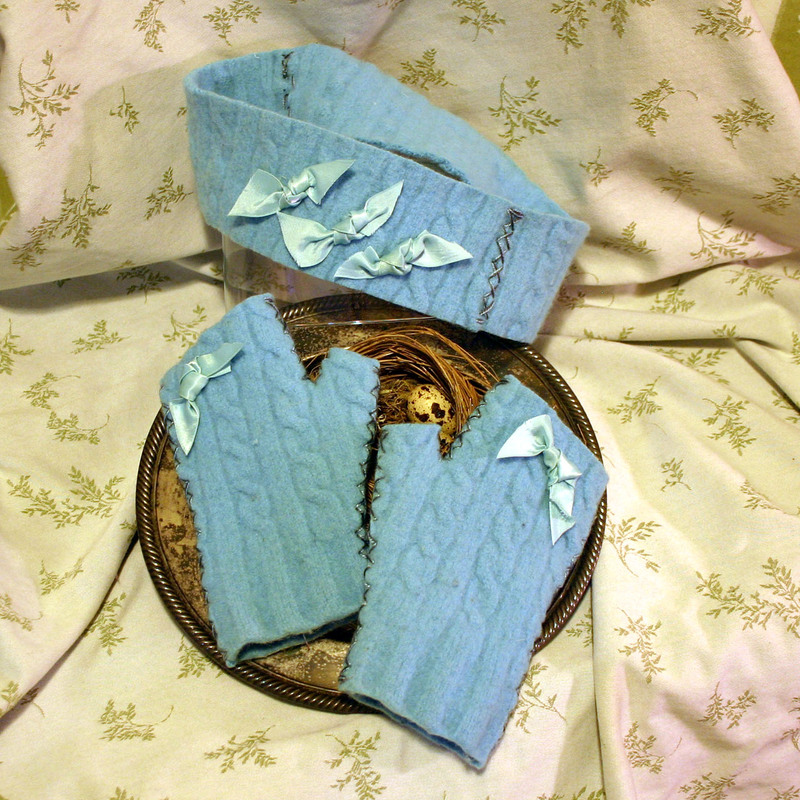 I have been known to use a men’s sweater collar for a decorative cuff and I like to use the bottom of a sweater or the sleeve cuff for the cuffs of gloves etc. Pin your pattern and cut it out! Since your wool doesn’t fray you don’t need finished seams (which is why I do this in the first place) you can easily construct just about anything from your wool … purses, hats, mittons, decorative items, flower pins, scarves, headbands – pretty much anything goes! 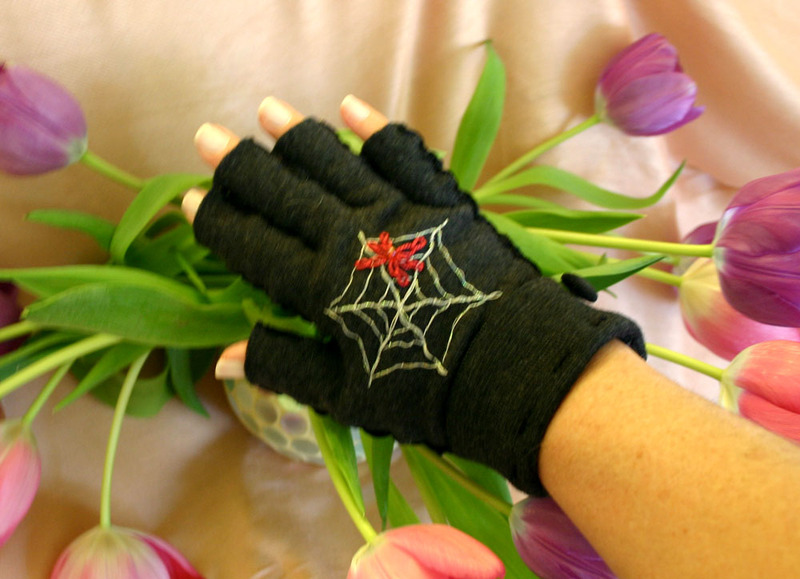 Decorate your item with embroidery, buttons, ribbon, complimentary wool or whatever is appealing to you. 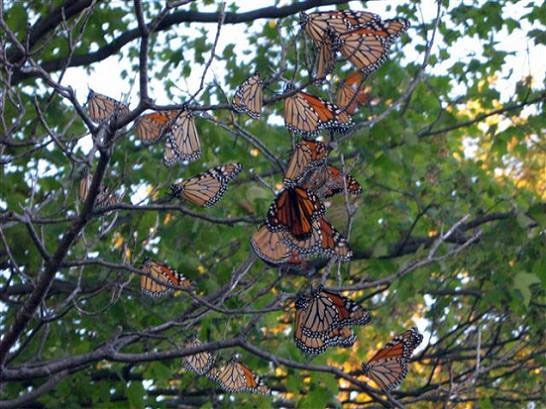 Th e Monarchs are coming! I don’t know about you, but I am really ready for Spring this year and I thought it would be fun to celebrate the advent of Spring and the migration with a color page. I hope you find inspiration and a breath of Spring with this page, as well. 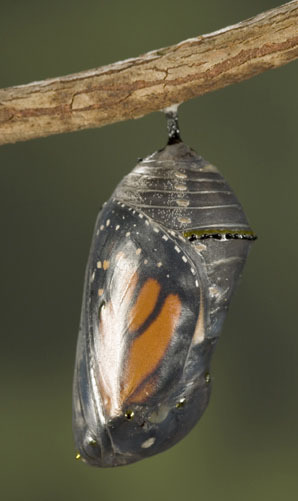 The page has a monarch butterfly landing on tulips and a cocoon in the corner. The file is in pdf format for easy printing. I would love to see your final results! 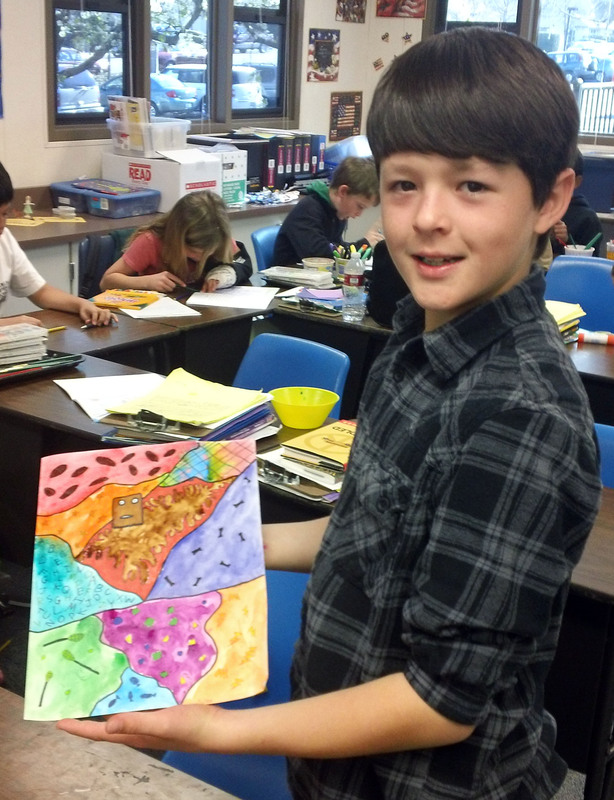 The artist Gustav Klimt is a recent find for me and I thought it would be fun to introduce his work to our 4th graders, as well as the Art Nouveau movement in the early 1900’s. 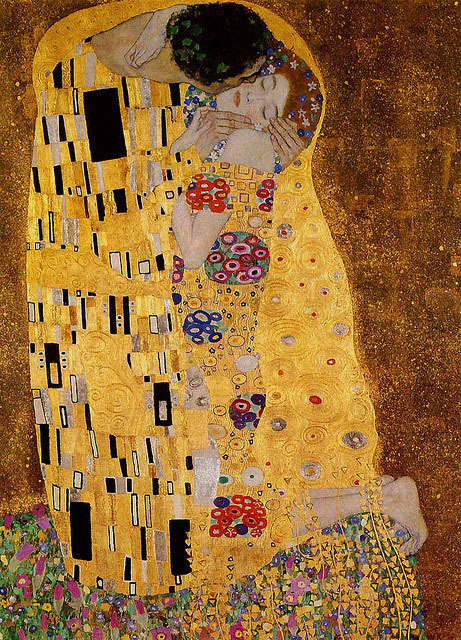 I love the organic lines in Art Nouveau, or “young” or “new” art, and the overall organic feeling and bright colors in Klimt’s art. Living in the SF Bay Area, we talked about how prevalent the Art Nouveau look is in the architecture of the City, as the architecture was re-born after the 1906 earthquake. Art Nouveau wasn’t just seen in paintings, it spanned across architecture, furniture, glass, and clothing design. 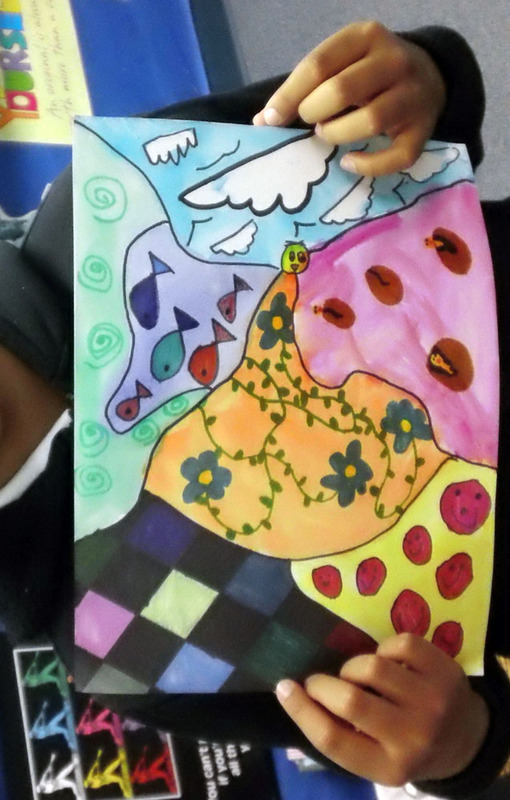 Our art project was based on Gustav Klimt’s painting, Baby in Quilt. 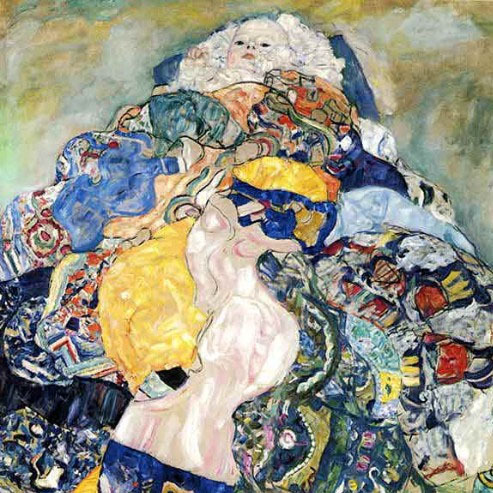 We talked about how many of the subjects in Klimt’s work seemed to be wrapped in a quilt-like environment and he used a very bright color palette. 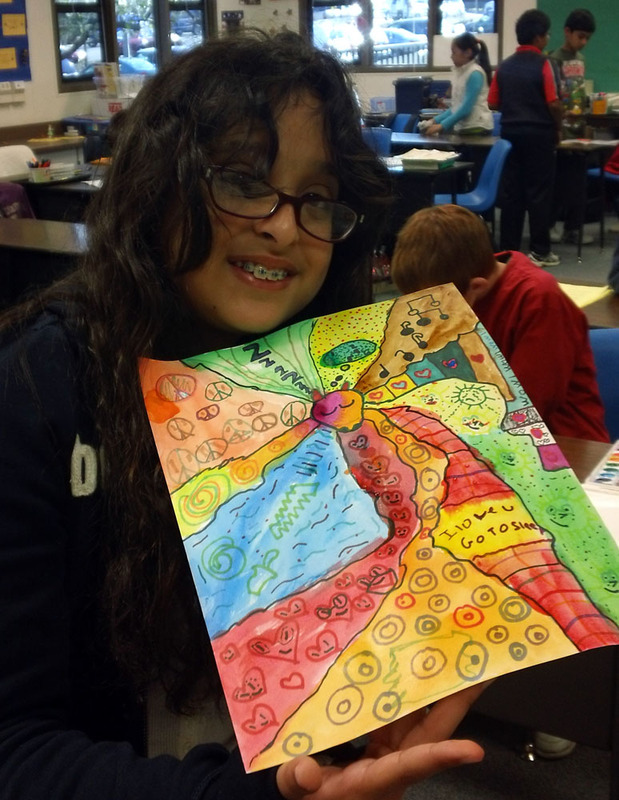 This project also became a talking point for multi-media projects, as we were using a couple of different mediums to finish our project – colored sharpies and watercolors. Students began their painting by choosing a living creature they cared enough to wrap in a quilt and drawing their head 3/4 of the way up the paper. 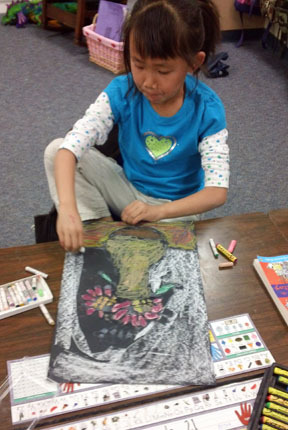 They then drew organic lines around the head to represent quilt pieces. Everything was outlined in black Sharpie. We talked a little about symbols and I asked them to try to put some symbols decorating their quilt square that would have some meaning to the subject (ie. dog bone for their dog, carrot for the bunny, etc. We then colored the symbols in the quilt in colored sharpies. After all the Sharpie-ing has been completed, we finished the quilt in watercolor. I liked the idea of watercolor because watercolor does not usually sit on the paper uniformly depending on the amount of pigment and water you use and it makes the quilt look like it is layered. Students were also able to get a tye- dye look by missing colors. If students didn’t want their colors mixing, I suggested they move from one corner to another, so it gave the watercolor a chance to dry before painting an area “next door”. 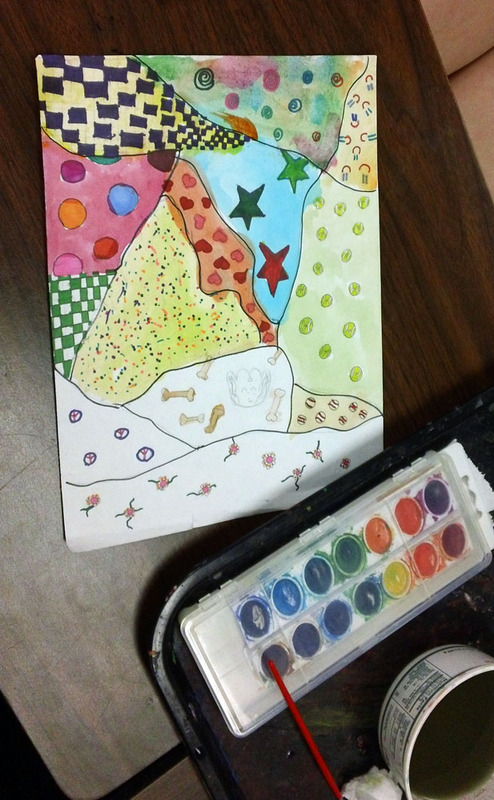 We used the extra bright Crayola watercolors instead of the more traditional colored Prang that I usually use. Students had a great time with this project and we had some really creative quilts for just about every imaginable “loved one” … even an alien was represented! Another of my favorites in 2nd grade because it seems everyone is successful with this project. It is so beautiful that everyone comes away with a frame-worthy picture! This project is one of the few that I spend 2 class times on and everyone finishes. 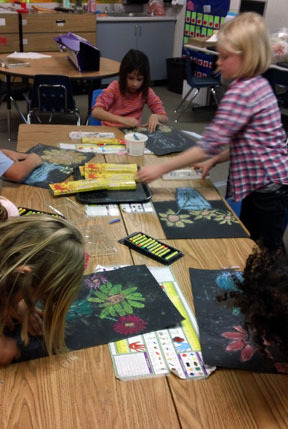 The first time we meet and after discussing Van Gogh and his interest in Japanese Woodcuts and his studies of sunflowers, students draw their LARGE sunflowers on 12×18″ black construction paper (I like Tru-Color). 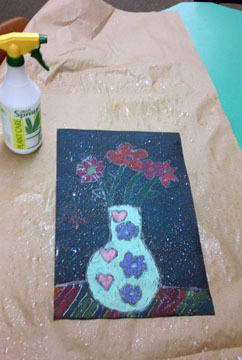 The vase is a simple stencil to help save time and start the “large” process, which can be hard for some at this age. I ask students to decide if their vase is clear glass or ceramic … if it is clear, what will we see?! They then have to draw the stems in the vase, and many times nice marbles or rocks at the bottom for interest. 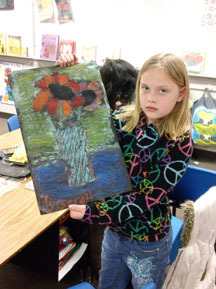 The vase needs to be sitting on something so students draw a line to show a tabletop. This year, I had one student who thought to make his table small and round … very “out-of-the-box” thinking! After all the pencil drawing is done, cover white glue along the pencil lines. This will protect the black paper when dry and give it the woodcut effect after adding the chalk and pastels. There is a fine line between too much glue and too little or dots instead of lines etc. 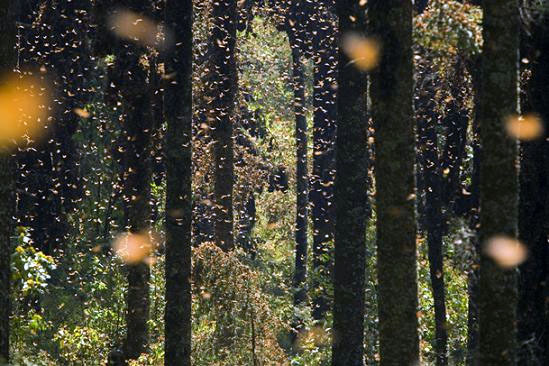 but in the end they all look beautiful. DAY 2 – IT IS TIME TO ADD THE COLOR! I found a use for the chalkboard chalk donated by a retiring teacher!!! It brightens our pictures like crazy!! 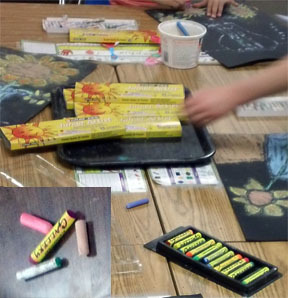 We use the chalk along with 2 kinds of pastels – regular Cray-Pas and Flourescent Gallery Pastels and the contrasts really makes these sunflowers POP! You have to use the chalk first and blend the pastels in last … the oil in the pastels repel the chalk. 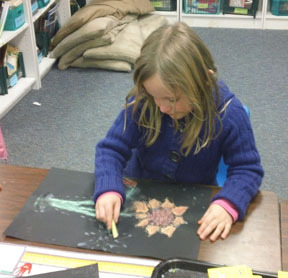 I ask that students cover their entire paper with color and show them that by turning the chalk on its side helps with laying a base of color, as well as giving their art a different look from using the tip of the chalk. Chalk and pastel tends to be very messy and doesn’t adhere to the paper well. To make sure that these masterpieces can be enjoyed for a long time, we spray them at the end to seal everything. Instead of using an aerosol of some kind (hair spray or you can by a non-toxic that still smells terrible) I mix a little white glue with water (about 1 part water to 6-7 parts water) in a spray bottle and spray across the art. Lay it flat to dry and when dry it is ready to mount! This project is always one I enjoy because I think it brings out the best in the boys. The boys feel free to experiment a little and bring a little craziness to their bust I don’t always see with other projects. 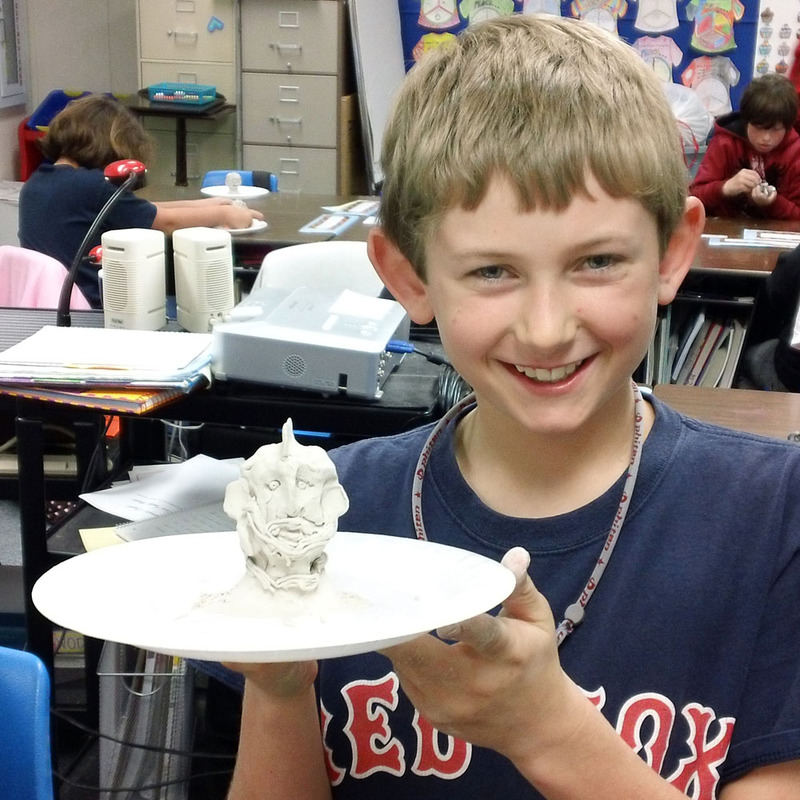 Clay seems to be the medium most boys thrive with. 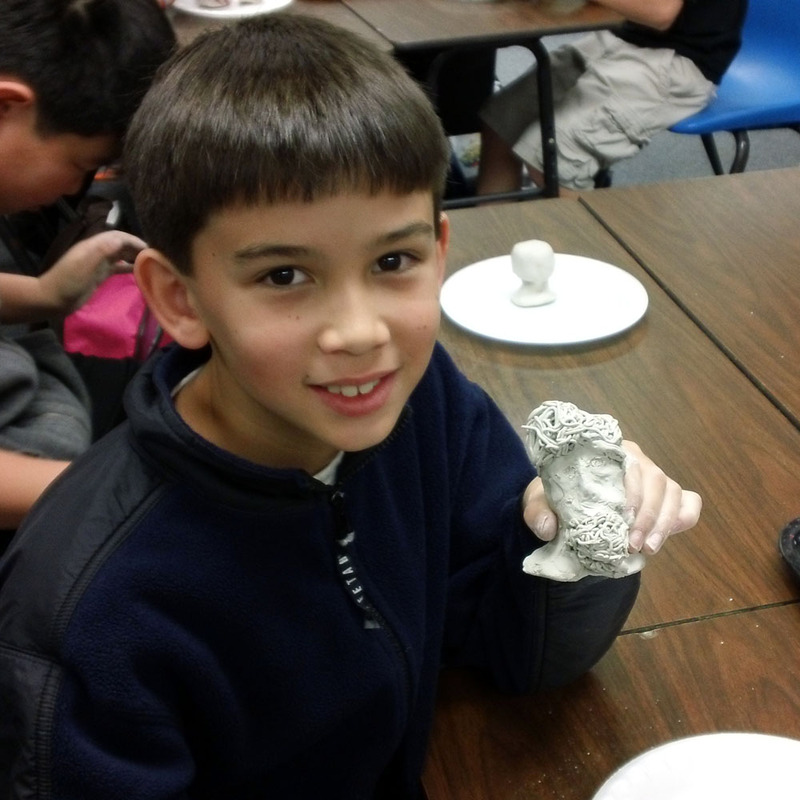 Don’t get me wrong … the girls do great job too, but some boys really struggle with drawing and painting and all those fine motor skill activities and clay helps them realize they are creative and artistic! It’s just like playing in the sand box or in the mud at the creek! 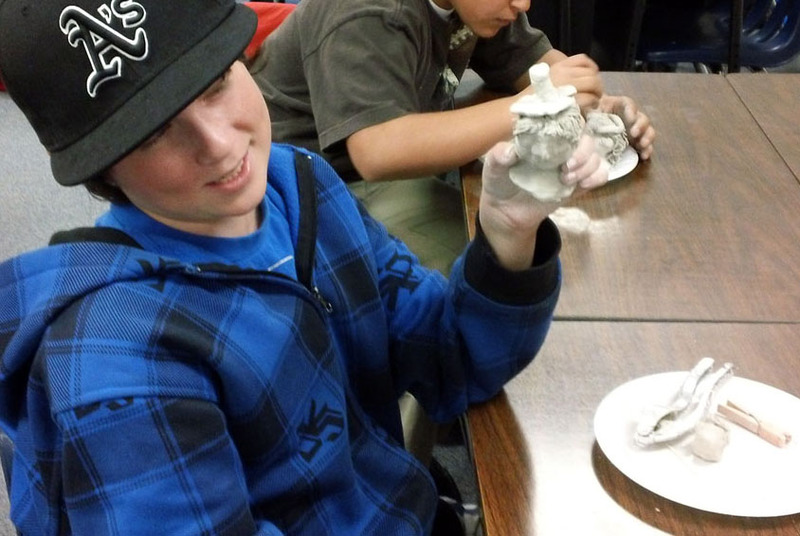 By the time they are ready to do clay 3-d heads, students have not only used clay before, but we have talked a lot about the map of the face – where the features belong (did you know your eyes are really in the middle of your head – not up towards your forehead?!?!) and keeping things in proportion. After some review on all these subjects, they are ready to rock and roll! This project is one that ties a lot of concepts together and students are able to pretty much just enjoy what they are doing and everyone is successful! 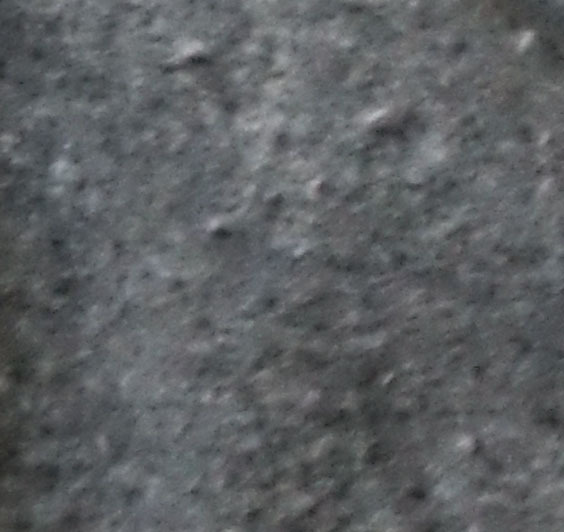 The clay I use is gray, self-drying clay (a day or 2) and I try to give everyone a pretty generous amount. A 25 pd brick breaks out to at least 65 students. I purchase it at Blick Art. 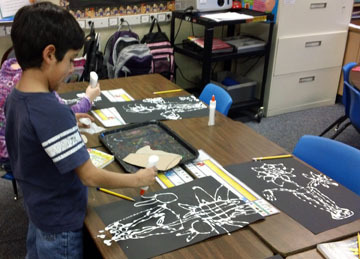 Students can paint or Sharpie details on if they like after the clay dries. Of course, our most valuable tool when using clay is our hands, but I also give students a simple toothpick, the sculpture tools I make from clothespins and a hook of paper clip, and it just wouldn’t be complete without the garlic press for cool hair. I like using plates for the clay. It really keeps the desks clean and helps with clean-up.